Is there a more apt host site for the Atlanta Convention & Visitors Bureau’s (ACVB) 106th Annual Meeting than the No. 1 convention, sports and entertainment destination in the world? Neither Marty McFly or Doc Brown would argue. 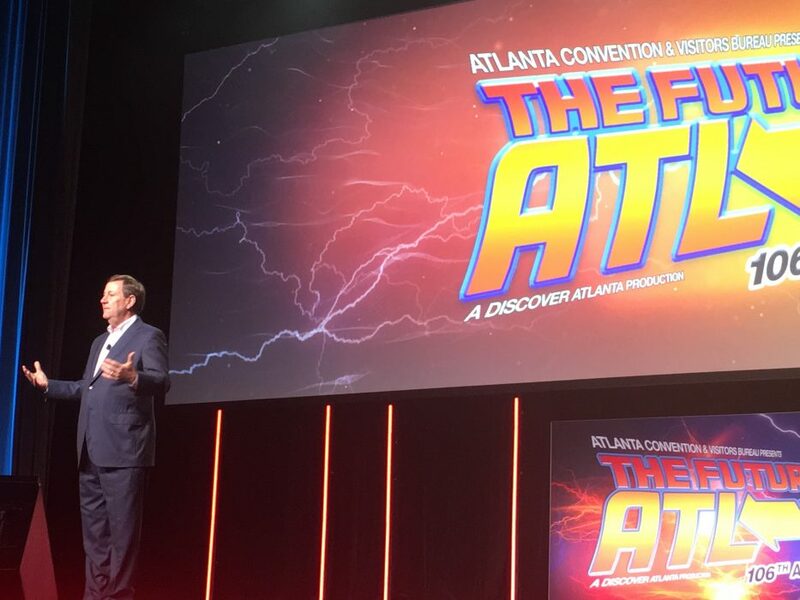 Featuring a “Back to the Future”-inspired theme, the ACVB program held Thursday (April 11) at the Georgia World Congress Center’s (GWCC) Georgia Ballroom celebrated 2018 as a banner year for the city’s $15 billion hospitality industry while painting an exciting picture of what’s to come. A panel of industry experts made presentations about new developments in downtown Atlanta’s core that will strengthen the city’s tourism base, and ACVB President and CEO William Pate delivered his State of Atlanta’s Hospitality Industry address. ACVB President and CEO William Pate delivering the State of Atlanta’s Hospitality Industry presentation Thursday at the Georgia Ballroom. Of course, no discussion of new developments in downtown Atlanta is complete without including the projects outlined in the GWCCA’s 2020 Vision master plan that is reshaping our 220-plus acre championship campus. And Pate’s remarks touched on these game-changing projects, including the GWCC’s under-construction expansion exhibit hall connecting Buildings B and C, the renovation of Centennial Olympic Park, and the recently-branded on-campus convention hotel, Signia Hilton. While discussing the overwhelming success of recently hosting Super Bowl LIII (right here on the GWCCA’s championship campus! ), Pate offered that Atlanta is well-positioned to continue attracting marquee sporting events. Another one already on the books comes in the form of next year’s NCAA Men’s Basketball Final Four (2020) at MBS on the GWCCA campus, with ancillary events at the GWCC and Centennial Olympic Park. In addition, the Atlanta Sports Council is working to land a portion of the 2026 FIFA World Cup at MBS, another College Football Playoff National Championship (which MBS/GWCCA hosted in 2018), and “perhaps another Super Bowl before 2030,” Pate said.